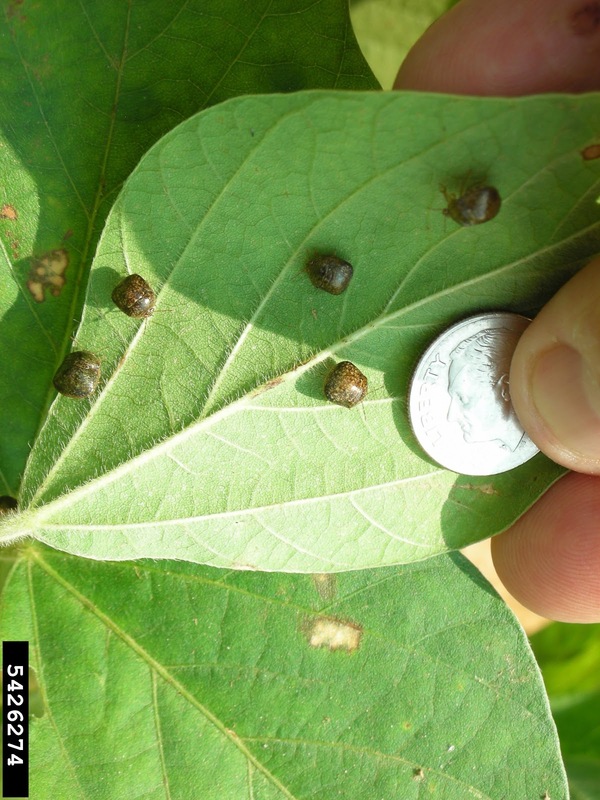 Dr. Scott Stewart, Extension Entomologist at the University of Tennessee’s research and education station in Jackson, TN has posted a blog concerning the first report of Kudzu bug on soybeans in Tennessee. I have included the entire text of his blog immediately below. Also, notice the link to the www.kudzubug.org web site. I offer my thanks to Mr. Cam Kenimer, the ANR agent in Fulton Co. KY, for bringing this to my attention. I’ve had the first report of a soybean field in Tennessee being treated for kudzu bug. The field is located in East Tennessee (Polk County). The threshold recommendation below is quoted directly from a website dedicated solely to this pest (www.kudzubug.org). There is a lot of good information on this site. My counterparts in the Southeast have been working with this pest at a fevered pace for the past three seasons and generating a lot of good data. I would discourage any panic spraying. Kudzu bug infestations on soybean will almost certainly be isolated to a few fields in a very limited area. I do not expect problems in the larger soybean growing areas found in Middle and West Tennessee during 2012. Insecticide Selection: There is a limited list of insecticide that are well tested and specifically list kudzu bug on the label. Of these, Brigade 2E (bifenthrin), Hero (a premix including bifenthrin) and Endigo (a premix) appear to provide the best control. Some other pyrethroids such as Mustang Max, Declare and Karate appear to perform pretty well in limited testing, although Karate [sic same active ingredient as Warrior dwj] does not specifically list kudzu bugs on the label. Sevin, Orthene and Dimethoate also appear to perform reasonably well. These products should be used at or near the full labeled rate. To see the original text follow the link immediately below. First, let me say that I concur completely with Dr. Stewart’s conclusions. In KY we should be even a bit further removed. Nevertheless, remember that this pest is not going to fly or walk to KY, but more likely to move on vehicles or in freight so its’ presence near the junction of I-75 and I-24 is important to us. At present, this is certainly the closest Kudzu bug infestation on soybean to Kentucky. The county from which this is reported (Polk) is in the southeastern portion of TN and is bordered on the east by North Carolina and on the south by Georgia. Of particular interest with respect to eastern / central KY, soybean (also garden beans / peas) production, this county’s western border is only about 10 miles east of I-75. Additionally, Polk Co. TN is only one county removed from the junction of I-75 and I-24. The pest has already been collected from Kudzu in Marion Co. TN which is astride I-24. Interstate-24, of course, goes through the heart of soybean production in western Kentucky. Because of interstate access, this infestation should be of as much interest to Kentucky producers as it is to those in Tennessee. There is no reason to panic at this point. As Dr. Stewart indicates for TN, we are quite unlikely to see any problem with this pest in Kentucky soybeans in 2012. I think we are much too far along. The story in 2013 may be a different. Photo Credit Figure 1: Philip Roberts, Univ. GA., bugwood.org. Aflatoxins are potent, naturally occurring toxins that sometimes develop in corn and certain other crops. Aflatoxins are also among the most carcinogenic substances known. There are well-defined limits on how much aflatoxin is allowable in corn, based on the intended end use. For example, corn intended for human consumption must have less than 20 ppb (parts-per-billion!). More information on aflatoxin can be found in the UK Extension publication, Aflatoxins in Corn, ID-59, at http://bulletin.ipm.illinois.edu/article.php?id=1244. · The mold associated with aflatoxin may not always be visible in contaminated grain. · The presence of the mold does not mean aflatoxin is present. · There are several green molds on corn, and they can be hard to tell apart. · Even when it occurs, aflatoxin is contamination is very sporadic for lots of reasons, so a grower may have very high levels in one field and low levels in another. Having now lowered expectations, I do think scouting is a good idea, especially this year. It might help producers manage their risks a little more wisely. : Spider mites beginning to appear on soybeans, can corn be far behind? I warned of this pest some time back (See KPN No. 1308 June 26, 2012. I Hate Crying Wolf…). In fact, I am mildly surprised that it has taken this long for field scouts to come across the pest. 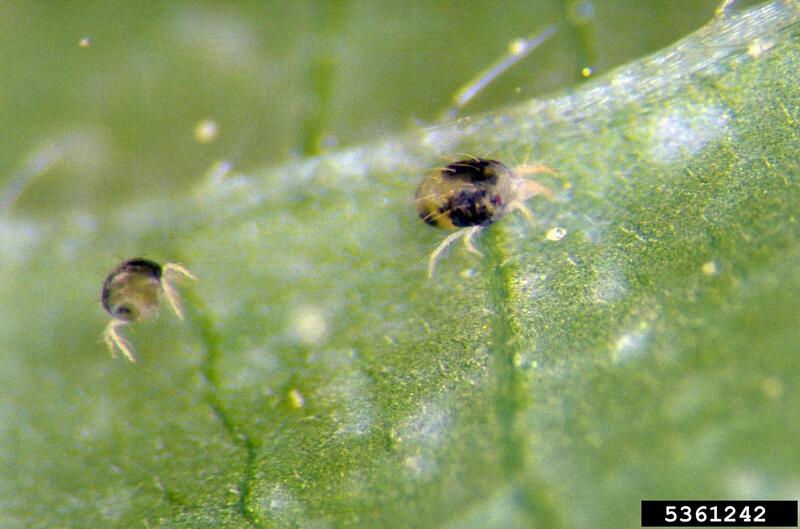 Reports of spider mites have alerted us of their activity and samples sent to the Plant Diagnostic Lab have confirmed that it is the two-spotted spider mite causing the problems. At present the damage appears to be on a small scale and very localized in fields. Somewhat surprisingly some of the infestations were noted in irrigated fields. For as long as we have drought stressed plants, and in particular LOW humidity, we are increasingly likely to be plagued by this pest. In soybeans, the most important time is during the reproductive stages of R1 (beginning bloom) - R5 (beginning seed) and it is even more likely in fields where a synthetic pyrethroid insecticide has been used. In our current corn production situation, it may very well be too late to worry about mites. In either case, one of the first and perhaps most important questions is: Am I likely to be able to make a crop? If you are or are planning to convert your corn to silage, then pay attention to the “days to harvest” restrictions on the product you choose to use. To sample in soybeans, shake plants over a piece of white paper and look for tiny, black, moving specks. You will need a hand lens to determine if the specks are actually mites, but if they are crawling across the paper you probably know the answer. In corn, scouting is much more difficult and less is known about making a control decision. The mites are no harder to find, simply follow the instructions for soybean but use corn leaves. One simply wishes to determine if the infestation is only on the outer edges or occurs across the field. You will need to sample several areas of the field. Mites are notorious for being spotty in their distribution. They also have a very strong “edge effect” which would include waterways, etc., that may cross the field. If a treatable infestation is found, it may very well be controlled by a border application. Scouting should start well before R1 (soybean) and in younger corn. Cooler temperatures and high humidity allow a natural fungus to control spider mites. Rainfall will help the plant tolerate the infestation but will not reduce the mite population. Application of synthetic pyrethroid insecticides and fungicides may worsen the infestation because these insecticides don’t work well on mites and the fungicide may hamper the natural occurring fungus that kills the mites. In corn, chlorpyrifos is not labeled for spider mites; dimethoate may not be applied during pollen shed. Bifenthrin may be used. See labels for rates and specific directions. Information on insecticides is supplied for the readers convenience. Use of a trade name does not constitute a recommendation. These products are not ranked in preference or efficacy. Always read and follow the label. Several people have contacted me concerning the presence of thrips on soybeans. 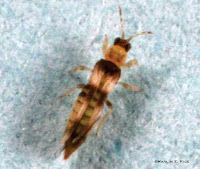 Thrips are a common pest of soybeans but rarely do they cause economic damage. Actually, given the drought stress that our production season has endured, I am surprised that this has not occurred earlier. Soybean thrips are very small slender insects. You will need a hand lens to see them. The immatures are yellow, while adults are black with yellow bands. These pests are common on flowers and weeds. They feed by rasping off the outer layer of the leaves and sucking the juices. This leaves a silvery appearance to the leaf surface. “Cupping” or other similar leaf distortion is often associated with thrips feeding. Another dead giveaway to their activity is the presence of black “tar spots” on the leaves. This is thrips excrement and the descriptive name is quite accurate. You will see lots of tar spots if there are many thrips around. Thrips rarely cause economic damage. Nevertheless, yields may be reduced if plants are under moisture stress and thrips populations are high. If over 75% of leaflets are damaged and there are an average of 8 thrips for every leaflet sampled, treatment may be advised. 3.) on average each leaflet has 8 or more thrips present. All three conditions should be met to consider an insecticidal application. Acephate (Orthene & others), beta-cyfluthrin (Baythroid), bifenthrin (Brigade & others), lambda cyhalothrin (Warrior & others), carbaryl (Sevin & others), cypermethrin (Mustang & others), and many others. Use of Trade name does not constitute a recommendation. These products are not ranked in preference or efficacy. The information is supplied for the readers convenience. Photo Credit: Marlin E. Rice, Iowa State Univ. I was just reading an article in AG Professional Magazine http://www.agprofessional.com/newsletters/agpro-weekly/articles/Dry-weather-crops-still-need-fungicides-162045795.html entitled "Dry Weather Crops Still Need Fungicide". The article was discussing the "Plant Health" benefits of strobilurins when applied to corn or soybean under "dry" conditions. The article did not mention the use of fungicides on crops that have been severely compromised by extended drought conditions. Everyone knows that extended drought greatly lowers yield potentials (hence the ability to recover the cost of the fungicide and application are very limited) AND disease pressure of most fungal diseases that are controlled by strobilurin fungicides is very low. Conversely charcoal rot can be very severe on both corn and soybean in drought years, but this disease is not controlled by any foliar fungicide. I will simply conclude by restating my the blog title: Application of Foliar Fungicides to Corn/Soybean Under Drought Conditions is a Bad Idea. The possibility of payments from the USDA Average Crop Revenue Election (ACRE) program increases as Kentucky average corn and soybean yield prospects decline. Kentucky corn crop conditions as of July 8th are rated at 34% very poor, 38% poor, 23% fair, 5% good, and 0% excellent. Kentucky soybean crop condition as of July 8th is rated at 23% very poor, 39% poor, 30% fair, 8% good, and 0% excellent. The following short discussion provides a brief review of the ACRE program and an analysis of potential for payments as of mid-July 2012. Kentucky yield prospects are dropping to unexpected levels. At this point it is unclear whether ACRE payments will occur and if so, the size of the payment. Currently it appears there is a good chance for corn ACRE payments in Kentucky for 2012/13 given the current crop conditions. Soybean ACRE payments appear less likely at this point, especially with the recent rainfall, but continuation in dryness with high temperatures would increase the possibility of soybean ACRE payments. Continue reading at: http://www.ca.uky.edu/agecon/index.php?p=110 or use GOOGLE with the title and author names. Pounds of N, P2O5, and K2O removed in silage at various silage yields. Greatest removal will be for potash. Make sure to soil sample if silage is not typically in your rotation, potash removal will be greater than for corn for grain. Typically, we don’t account for nitrogen removal or carryover to other crops with the exception of wheat. Usually, wheat following well-fertilized corn should have enough nitrogen for fall growth. With limited nitrogen uptake this year in the corn, nitrogen in the fall for wheat (or other fall-seeded crops) should be sufficient. Monitor wheat growth. If the wheat appears to be N limited, then apply more than 40 lbs N/A in the fall. Dry soil conditions can enhance persistence of herbicides such as atrazine. Kentucky has had dry seasons in the past, yet atrazine injury to rotational crops was seldom an issue. Having said that, the risk of crop injury due to atrazine carryover is still an issue that we need to consider on a case by case basis. The risk will be reduced if atrazine was applied early spring and had some rain to move into the soil profile. Prolonged periods of dry soil will enhance persistence and increase the chance of injuring rotational crops. If weather conditions improve and we have a mild and wet fall and winter, then the risk of carryover to spring planted crops will be reduced. Using high rates of atrazine will increase the risks. Atrazine may dissipate more rapidly in no-till compared with tilled conditions. High soil pH (pH >7.0) will increase atrazine persistence. While many farmers have already given up on the corn crop this season, others are waiting a little longer. Identifying the success of pollination in a field can go a long way to determining whether or not to give up grain yield goals. the tassel shows no evidence of additional pollen. Anthers fully exposed across the entire tassel indicates that pollination is nearly complete (Figure 1). Pollen release normally begins near the middle of the tassel and then upwards and downwards. If the plant is still pollinating, a gentle shake of the tassel should release some of the small pollen grains. If there are no pollen grains, then pollination is probably complete. Brown silks on are an indication that pollination is complete as well (Figure 2). These indicators are important, because in many fields, pollen drop has occurred before silk emergence. Gently cutting open the husks around the ear can reveal the silks and developing ear. Once pollen travels down the silk and fertilizes and ovule, the silks detach from the young kernel. A gentle shake of the ear will help you identify the amount of pollination that has occurred. As kernel development progresses, identifying pollination success becomes easier. Developing kernels are easy to see (Figures 3 and 4) while the blanks are easy to see as well. An ear where all almost all kernels are developing is evidence of excellent pollination (Figure 5). Temperatures near 100 F can kill pollen. Since June 28, 2012, many corn fields in Kentucky, including the ones in these pictures, have experienced seven days above 100 F. Pollen drop normally occurs for about a week or two. However, peak pollination is normally about the third day of pollen drop. Based on the ears in Figures 3 and 4, pollination was severely impaired by the high temperatures. In both of these cases, those ears represented less than half of the ears in the field. The other half had not released silks, yet. With pollination complete in those fields, that means that half of the ears will not be fertilized at all. In fields such as these, salvaging the crop as a silage is probably the best option. Be sure to check with your crop insurance agent before making any decision to cut the crop for silage. 1. If corn is going to be fed as green chop, grazed, or as hay, test for nitrates before harvest to be sure the crop will be safe to feed. For corn harvested properly as silage or baleage and which goes through a good fermentation, nitrate levels could decrease 30 to 50% and can be tested after fermentation and before being fed. If you need to decide which corn fields to harvest as silage or hay, testing before harvesting will allow one to determine which fields need to be harvested as silage (those higher in nitrates) and those with safe levels of nitrates which can be harvested as corn hay. For sorghums and sorghum-sudangrasses, nitrates should be tested before harvest to be safe for your harvest method. Southern corn rust was discovered quite early this season in the deep South. It has since spread to Arkansas and Georgia. See http://scr.ipmpipe.org/cgi-bin/sbr/public.cgi to monitor its progress. · Western Kentucky is experiencing extreme drought. Furthermore, air masses over the region have been dry, reducing the duration and intensity of leaf wetness periods due to dew. · Corn crops are generally past silking, and yields are expected to be low in many areas, because of reduced pollination. Even if southern rust should move in later, it might be hard to recover the cost of a fungicide in a field with low yield potential, especially if air masses remain dry and disease progress is slowed. I think the situation still bears monitoring, but I am much less concerned about this threat than I was a month ago. Fungicide use decisions for soybean must be made in the very near future, if not now. Recently I was reading an article on the Plant Management Network (http://www.plantmanagementnetwork.org/pub/php/news/2012/TimelyFungicideApplication/) regarding the timely use of foliar fungicides to achieve maximum effect on soybean. The article stated that the recent mild winter has resulted in an increased disease risk that growers should take into consideration when making fungicide use decisions. I am sure that some parts of the country probably do have an increased disease risk as a result of the mild winter, but I do not believe Kentucky is among them. In most years, foliar, pod and stem (FPS) fungal diseases of soybean are held in check by planting adapted varieties (mostly MG 4 varieties), avoiding extremely early planting dates (full season crops) or planting late (doublecrop soybean), crop rotation, limited-sporadic rainfall and high temperatures during the summer months, and timely harvest. Typically, measurable yield losses caused FPS diseases–the targets of foliar fungicides–are limited to certain environments like river-bottoms, fields prone to extended periods of dew or fog, and continuous soybean fields. Early maturing varieties (mainly group 3) are often impacted by damaging levels of FPS diseases, especially when planted early. The same is true for crops that are not harvested on time. However, FPS diseases are usually not that destructive in Kentucky. True enough, the winter of 2011-12 was very mild, even by Kentucky’s standards. However, if anything, the mild conditions probably enhanced residue breakdown, thereby reducing fungal survival in weed and crop residue, due to increased microbial activity. Moreover, early planting may have been somewhat more common this year, but the higher than normal temperatures and limited rainfall in April to early-May likely negated the increased risk to FPS diseases normally associated with early planting. I simply cannot reconcile how the mild winter might have increased the potential for soybean FPS fungal diseases to occur in Kentucky. I will concede that the mild winter may have increased the risk of insect-vectored virus diseases, such as bean pod mottle virus (transmitted by bean leaf beetles) and soybean mosaic virus (aphid-transmitted); however, these viruses are not controlled by foliar fungicides. Of course, the mild winter did favor survival of the soybean rust pathogen in the deep South, but our winter, although mild, was still too cold to allow soybean rust to survive the winter in Kentucky. In summary, I do not believe that the mild winter of 2011-12 has resulted in greater than normal potential for FPS fungal diseases to occur in Kentucky soybeans. Dry, and now extremely hot and dry, weather across most of the state has kept fungal diseases in check up to now. The soybean crop is very stressed and if some relief does not come soon, yields will be seriously hurt by drought and perhaps charcoal rot and soybean cyst nematode, but not by not by FPS diseases. Strobilurin-based fungicides, such as Headline® or Quadris®, or strobilurin-triazole products, such as Stratego YLD® are reported to impart some stress tolerance to treated crops. Nonetheless, it is my experience that stress tolerance benefits are simply overwhelmed when soil moisture is limiting for an extended period of time (e.g., drought). It is anyone’s guess how the rest of the season will play out, but it is my opinion that it may be difficult to recover the costs associated with applying a fungicide this season unless July and August turn wet. Many doublecrop fields are still not planted due to exceptionally dry soil conditions. However, doublecrop soybeans do not generally respond well to foliar fungicides even in a season with decent moisture. This may be a good year to consider leaving the fungicide sprayer in the barn.